Would you like to ask something related to any of our Florence Day Tours, request a travel plan for multiple days in Florence, ask directions on how to reach our city or on what can be done in the surroundings, simply speak about things to do in Florence Italy? 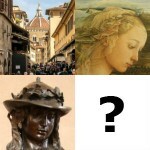 Well, what’s better than contacting a local genuine Florence Tourist Guide, ready to answer? My great Art History teacher always said: “there are no stupid questions”. Don’t be shy, ask yours: contacting a Florence Tourist guide is your best chance to get fresh, up to date info on your destination, and maybe get a discount on our Florence Walking Tours. It’s as easy as compiling the form below. We are here to answer your questions.